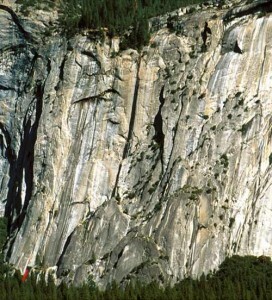 This climb’s start is difficult, but quickly eases making it an ideal first 5.10 lead. The protection is solid, especially at the distinct 5.10a finger crack crux. You can barely toprope the climb with a 60m rope. (Bring a few extra big cams and long slings to extend the anchor.) Descend by scrambling back to the wall and then down 3rd class (wet in spring). Which SuperTopo guidebooks include a topo for Peruvian Flake?